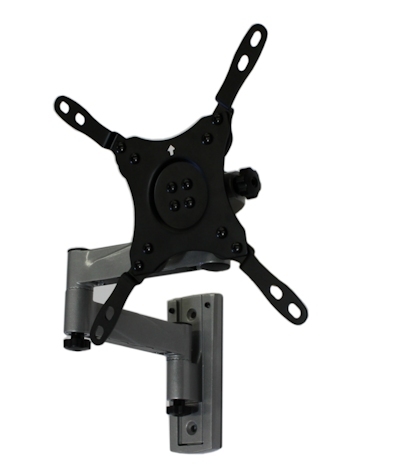 FIXED Mount Holes (WxH): 3" x 3" , 4" x 4" , ~8" x 4" , ~8" x ~8"
The LDA18-222 is an articulating wall mount for 13"-42" flat-panel TVs up to 15kg/33lbs especially designed for RVs, TRAILERS, ICE HOUSES, or other mobile units. 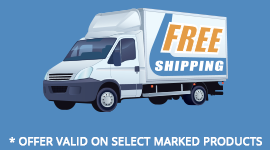 With enhanced fixing structure, it can be widely applied in RVs, Motor Homes, Caravans, or Ice Houses where the TV needs to be protected from the damage while travelling. Full motion allows maximum flexibility tilts, swivel and extend your TV up to 390mm from the wall in every direction for easy viewing and also can be fold when not in use for saving space. In-arm cable clip routes cables for a clean appearance. Slide-in wall plate ensures easy installation. VESA-compatible fits 75 x 75, 100 x 100, 200 x 100 and 200 x 200 hole patterns. TWO REAR DOCKING PLATES are included so TV easily slides in and out of the docking stations and can be transferred effortlessly from one station to the other! 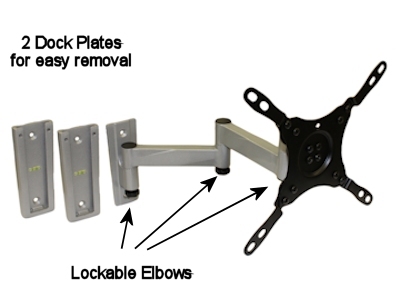 Each ARM joint is fully lockable ensuring your TV will stay in its place during travel. Suitable for mounting monitors, and smaller LED, LCD, and plasma sets from 13-42in diag up to 33 lbs. Minimum Arm (when fully collapsed): Approx 3.5"
Maximum Arm Reach (when fully extended): 15.43"